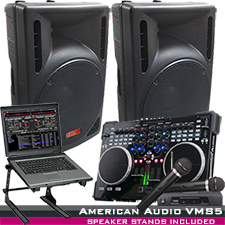 Start DJing at weddings, reunions, parties and school dances. 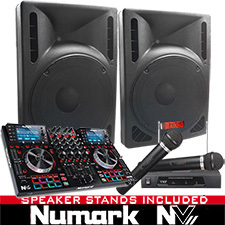 The Best Selling DJ System Ever! 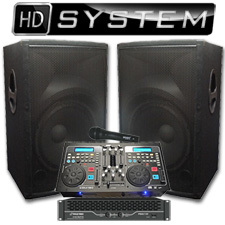 DJSYS-42 - Includes Virtual DJ Software, VMS5 controller - Mixer, A pair of Powered DJ Speakers and two wireless mics. 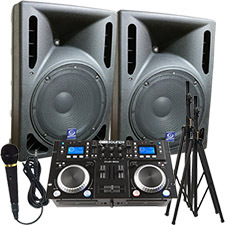 Connect your Computer, iPod or play CD's & MP3s A ready-to-go DJ package with a digital DJ mixer, 12" PAs, headphones, mic, and more. 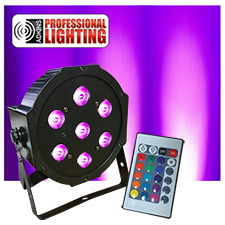 Includes a simple to use Remote Control to easily choose your color. 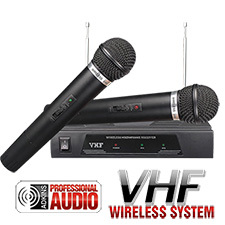 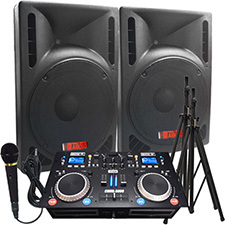 Everything you need to start performing at Weddings, Reunions, Partys, or even School Dances DJSYS-40 - Order this package today and you'll have everything you need to start performing. 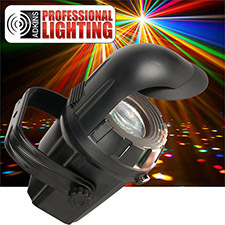 Wide coverage angle, great for mobile applications. 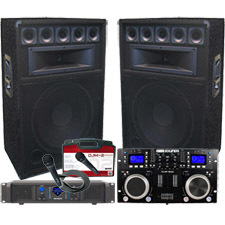 DEAL OF THE DAY!!! 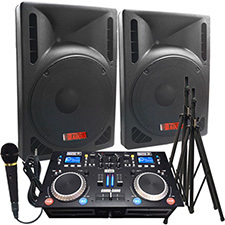 4100 Watt DJ System - Connect your Laptop. 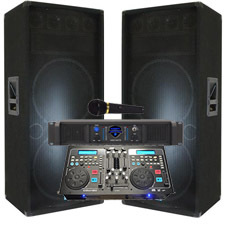 iPod or play CD's! 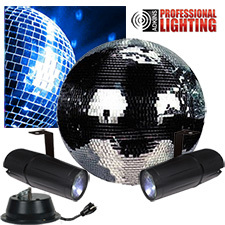 20" Motorized Mirror Ball Package 2000 Watts! 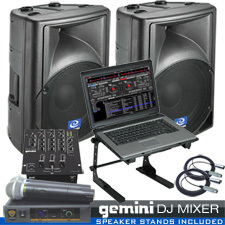 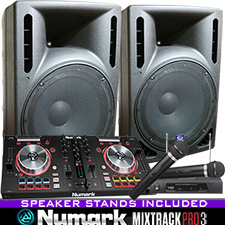 - Complete DJ System - Everything you need to DJ - 12" Powered Speakers - Connect your Laptop, iPod or play CD's! 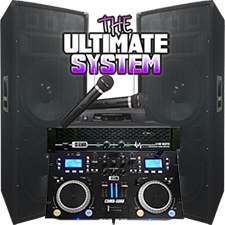 DJSYS-55 - 4200 Watt DJ System - Dual CD Player, Dj Mixer, Microphone, 4200 watt Amplifier, Two Dual 15" Speakers, and cables! 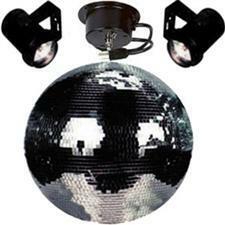 20" Mirror Ball Party Kit Start DJing at weddings, reunions, parties and school dances. 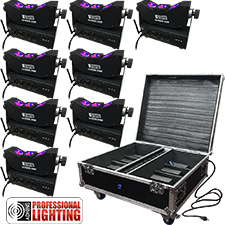 LED Tri-Beam RGBA Wireless Battery Up-Light 8 Lights with Case - Adkins Professional Lighting 6100 Watts - DJ System - Dual 15" Speakers - Play from your Laptop or Cd's. 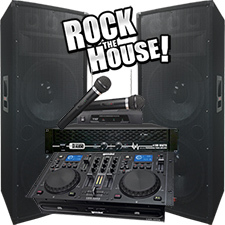 - Ready to ROCK THE HOUSE! 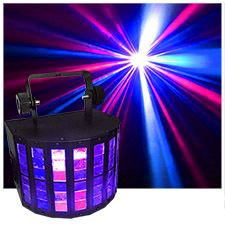 Micro Moonflower Burst LED DJ Lighting Effect - Twice as bright as the ADJ Micro Burst. 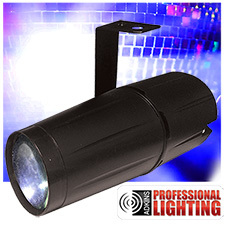 LED Tri-Beam RGBA Wireless Battery Up-Light - Adkins Professional Lighting DJSYS-6 - Ultimate High Output Dual 15" speakers. 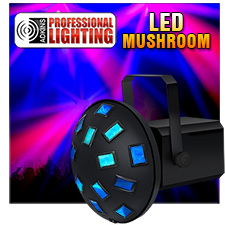 Connect your computer or play CD's or MP3's Super Bright 10 watt LED.